17 | November | 2008 | can i just finish my waffle? Well, I lost out on my pick for president, and all I am hearing is layoffs and bailout, bailout, bailout — not very encouraging. So I seem to be focusing on anything to get my mind off the reality of it. Which brings me to the glasses. 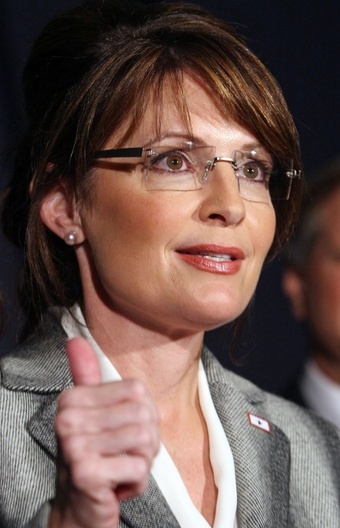 I love Sarah Palin’s glasses. They are beautiful or is she beautiful or both? I think they make her look. I saw her at one appearance where she was wearing another pair, with a dark rim, and she didn’t look comfortable in them. I was glad to see she went back to her original style and did not fall into the mold of the smaller, square type, dark-rimmed style which may look good and smart on others, but would not look good on her. The frames are designed by Kazuo Kawasaki, from the 704 series, in 34 gray. They start at $375 but can hit $700, depending on the lenses. OR look here for non-prescription lookalikes for about $50.00 or less. They were supposedly selling like hotcakes in September.